Yes. 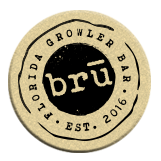 We started BRU partially because we’re parents of two young kids and saw that it was challenging for local families to have a place to go to try great craft beers without driving across town to a brewery or sneaking them into a sketchy bar. As long as the kids are keeping volume to a normal level and not smashing glassware, we’re a-okay. We’ve got games out and coloring books behind the bar. If they are rowdy, we’ll give them a pint of nitro coffee and send them to the patio out back.